Sony announced the WF-SP700N wireless ear buds back at CES 2017 back in January, and while a great device, it is still stuck on BT 4.1 and features rather dismal battery life, 3 hours. In addition the price is a bit expensive and even the same price as the WF-1000X in some countries. Now a new model has appeared and is set to debut soon at IFA 2018 in early September. The WF-SP900. Not much is known about this model, it has not been certified on the direct US FCC and no bluetooth certification either. But if the name is anything to go by, then we are looking at a wireless ear bud like the SP700N but lacking noise cancellation. The model number does suggest a higher end and more expensive model than than SP700N, so the lack of noise cancellation is odd. 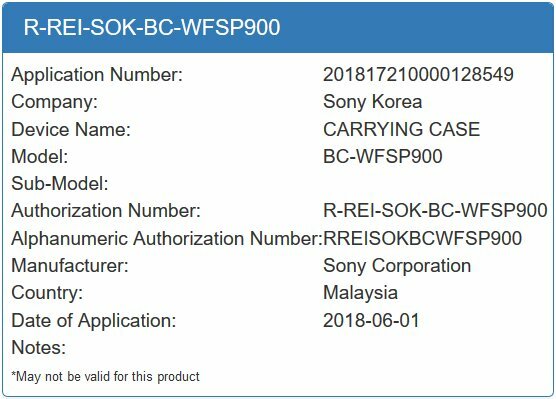 The device was certified in Indonesia not to long ago, along with the new A-Series Walkman. Below are some certifications from the FCC but not exactly the FCC. What I mean is that in the normal FCC search, I cannot find the device, but googling does bring up the 2 reports linked down below.